A North Yorkshire teenager has secured himself a unique position with one of the UK’s best-known breweries. 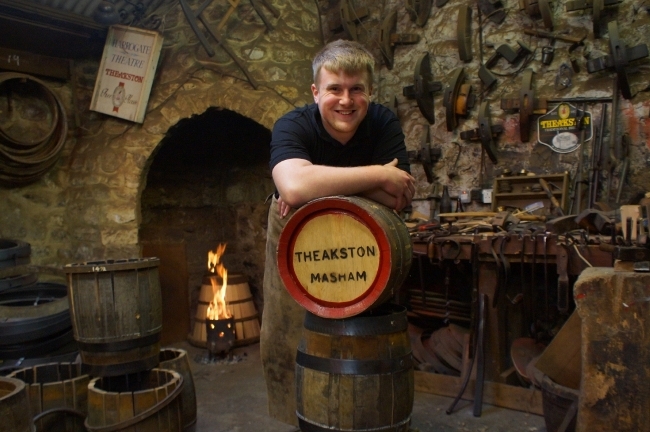 For Ashley Thompson, from Thornton Watlass, has joined Masham-based T&R Theakston Ltd in a position as the country’s only brewery-employed Apprentice Craft Cooper. The 19-year-old, who has a Level 1, 2 and 3 qualification in carpentry and joinery, will serve his four-year apprenticeship under the tutelage of Theakston’s existing Craft Cooper, Jonathan Manby. During his apprenticeship, the former Bedale High School pupil – who has worked for the legendary “Mouseman” joiners Robert Thompson’s – will learn the intricacies of an ancient trade, which is being kept alive by the brewery, known world-wide for its Old Peculier ale. Ashley said: “Working with wood, and for a brewery, is my dream job! When I was ten, I saw Jonathan demonstrating his coopering skills at the Great Yorkshire Show. It was a magical experience and one I have never forgotten. “When I saw that Theakston’s were advertising for an Apprentice Craft Cooper to work under Jonathan I couldn’t believe my luck and I applied immediately. “I’m thrilled to have been chosen for the job, even if it is a daunting thought that I am the only brewery-employed Apprentice Craft Cooper in the entire country. T&R Theakston Ltd Executive Director Simon Theakston said: “We are very proud to be keeping the traditional art of Coopering well and truly alive. “Ashley joins a long and distinguished line of Apprentice Craft Coopers here at Theakston’s, and he is extremely lucky to be learning from Jonathan Manby, who is an outstanding exponent of the craft. “Traditionally-brewed British craft ale is becoming more popular, year in year out, and we are creating new, exciting beers to tempt the taste buds of both existing and new customers alike.